Invented by Corning in 1939, Corning® Vycor® Glass has been used in a wide range of applications over the years, from laboratory equipment to early spacecraft viewing ports. A blend of 96% silica and 4% boron trioxide, Corning® Vycor® Glass is a high-temperature glass valued for its low coefficient of thermal expansion — 7.5 x 10-7/°C when measured between 0 °C (32 °F) and 300 °C (572 °F). It also features excellent thermal shock resistance and superior optical qualities. Recently, however, Corning discontinued Corning® Vycor® Glass, and now companies across various industries are searching for reliable alternatives. Among dozens of types of glass, quartz is one of the best replacements for Corning® Vycor® Glass. Extremely versatile, quartz — like Corning® Vycor® Glass — is a high-silica glass, as it’s produced from naturally occurring quartz, which is composed entirely of silica dioxide. Because quartz is naturally occurring, quartz glass may have residual levels of impurities, but these typically only affect ultraviolet transmission. Like Corning® Vycor® Glass, quartz has superior optical properties and strong thermal performance variables, including high working and melting temperatures, thermal shock resistance, and low coefficient of thermal expansion. Quartz also exhibits strong resistance to corrosion caused by atmospheric gases, water, and acid, and has good electrical properties. Versatile and reliable, quartz is an ideal Corning® Vycor® Glass replacement for any project that requires strong, high-performance glass. Although quartz is an excellent Corning® Vycor® Glass alternative for many applications, you may require a different material depending on the intended end use of the glass. Extreme applications, in particular, often necessitate a different Corning® Vycor® Glass substitute. Founded nearly 100 years ago, Swift Glass Co. is an industry-leading manufacturer of fabricated glass parts. Over the decades, we’ve developed a wealth of expertise working with a variety of glasses, many of which are well suited for use as Corning® Vycor® Glass alternatives. To learn more about glass materials that can withstand extreme temperatures, download our free eBook, “Creating Glass That Withstands Extreme Environments,” or contact the team today to discuss your specific needs. Used in a range of industries and applications, sight glass is used to check the level of liquid in a reservoir or supply line. Critical tools for ensuring operations are running safely and smoothly, these transparent tubes or windows allow users unimpeded observation in order to monitor conditions in piping, vessels, chemical reactors, and other industrial equipment. Because sight glass is made from sturdy glass substrates, it can be used in harsh conditions and can withstand high temperatures and pressures, as well as chemical attacks. Sight glass may be subjected to thermal shock, caustics, abrasives, and impacts. But only properly designed, appropriately thick sight glasses will offer reliable resilience. Specific sight glass design will depend on the specific application, so it’s important to carefully consider the exact conditions the glass will be exposed to and any potential hazards or special requirements. Various internal and external forces can impact the strength of glass components, and even minute flaws in the glass can lead to failure, so selecting the appropriate thickness is crucial. Glossing over these preliminary considerations can result in a subpar design, increasing the risk of sight glass failure. This wastes both time and money, as projects must be stopped until the equipment can be repaired or replaced. Even more importantly, these failures can be extremely dangerous to the operator and surrounding workers, resulting in injury or even death. There are several factors to consider when selecting sight glass thickness, but temperature and pressure, in particular, play key roles. When designing sight glass, it’s important to consider any temperature extremes in which it will operate, determine whether the temperature will fluctuate, and pinpoint the highest and lowest possible temperatures. Certain glass types perform differently depending on the temperature range. For example, soda lime glass can be used at temperatures less than 300 °F, while borosilicate glass can be used at temperatures up to 500 °F. Quartz or sapphire glass should be used for temperatures greater than 500 °F. The various pressure capabilities of sight glass assemblies are determined by the material, thickness, and unsupported diameter, and both normal operating pressure and peak upset pressure should be taken into consideration when creating sight glass thickness specifications. As a worldwide leader in the manufacture of quality fabricated glass parts, Swift Glass has years of experience fabricating sight glass for many applications. 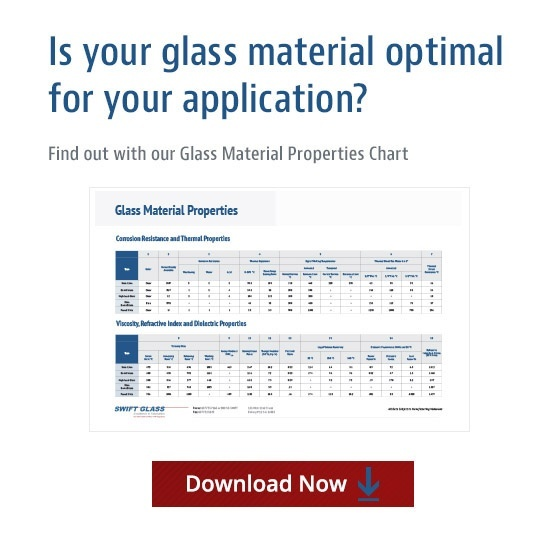 To make the process for our customers even easier, we’ve created a glass-thickness calculator; simply type in the unsupported diameter of the glass you’re working with, as well as the PSI it needs to withstand, and it will provide the recommended thickness to ensure optimal strength and durability. If you already have the unsupported diameter and the thickness of the piece of glass you’re working with — enter those values and calculate the PSI it will be able to withstand. Glass materials can receive many different types of glass edge treatments, each of which will uniquely affect the overall functionality and performance of the finished piece. Edging can improve safety, aesthetics, functionality, and cleanliness while improving dimensional tolerance and helping to prevent chipping. Below, we’ll explore five common glass edge types and their unique benefits. Also referred to as safety seams or swiped edges, this type of glass edging — in which a sanding belt is used to lightly sand off sharp edges — is primarily employed to ensure the finished piece is safe for handling. This style of edging does not provide a smooth, cosmetically finished edge and is not used for decorative purposes; therefore, this method is ideal for applications in which the edge of the glass piece will not be exposed, such as the glass installed into the frame of fireplace doors. This type of edging involves flat grinding glass edges until they are smooth and then running the top and bottom edges along a belt to eliminate sharpness and remove chips. The resulting glass piece features a smooth chamfer top and bottom with an exterior ground edge. Available with straight or curved bevels, chamfered edges are most often seen on frameless mirrors, such as those on medicine cabinets. Pencil grinding, achieved through the use of a diamond-embedded grinding wheel, is used to create a slightly rounded edge and allows for a frosty, satin, or matte glass finish. “Pencil” refers to the edge radius, which is similar to a pencil or C shape. This grind is also referred to as a Semi-Polished Edge. Pencil polished glass edges are ground smooth, finished with a shiny or glossy polish, and feature a slight curve. The unique finish makes pencil polishing ideal for aesthetics-focused applications. Like pencil-ground edges, the edge’s radius is similar to a pencil or C shape. This method involves cutting the edges of the glass and then flat polishing them, resulting in a sleek appearance and shiny or glossy finish. Most flat-polished applications also employ a small 45° angle chamfer on the top and bottom glass edges to remove sharpness and “chatter” which can also be polished. Swift Glass can accommodate a variety of glass edgework methods. To learn more about the different types of edgework available, download our comprehensive Edgework Terminology Infographic, complete with multiple surface views and detailed descriptions of various glass edge types.